If you’re a show biz buff, you no doubt know all about George White’s Scandals, one notch below Ziegfeld’s Follies, and one above Earl Carroll’s Vanities in the heyday of Broadway revues. But I’ll lay dollars to donuts you didn’t know who this George White was! Born this day in 1892, White was a hoofer who got his start in burlesque. 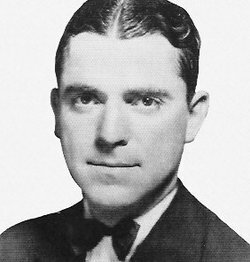 His first vaudeville partner was Benny Ryan in the two-act Ryan and White. For most of the teens he vacillated between performing as a single and in teams with the likes of Ann Pennington and Lucille Cavanaugh. He was big time stuff in that decade, appearing in the Ziegfield Follies numerous times between between 1911 and 1915, and the Palace between 1913 and 1917. In 1919 he launched the Scandals — the series hit big, and many of the top performers of the day starred in it. It finally folded in 1939, but revues in general were dead by then anyhow. There were also several Hollywood film versions in 1934, 1935 and 1945. Legal trouble following a car accident plagued his latter decades, though he continued to produce on a much smaller scale. He passed away in 1968. To find out more about the history of vaudeville and hoofers like George White, please consult my critically acclaimed book No Applause, Just Throw Money: The Book That Made Vaudeville Famous, available at Amazon, Barnes and Noble, and many other fine establishments. Previous Two World Premieres This Month!